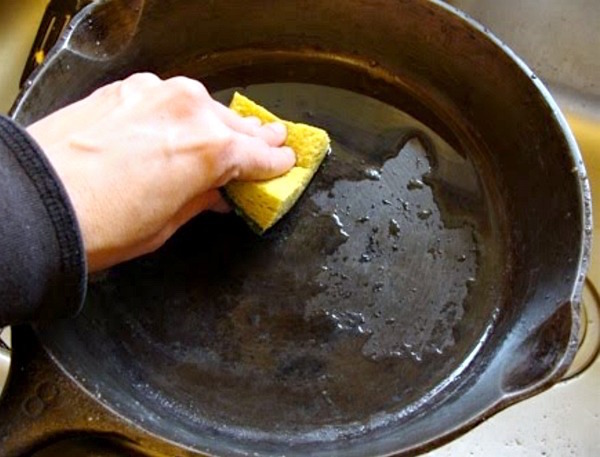 Learn the secret to clean and care for cast iron, creating a non-stick surface that will have you throwing away all your chipping, old non-stick pans. 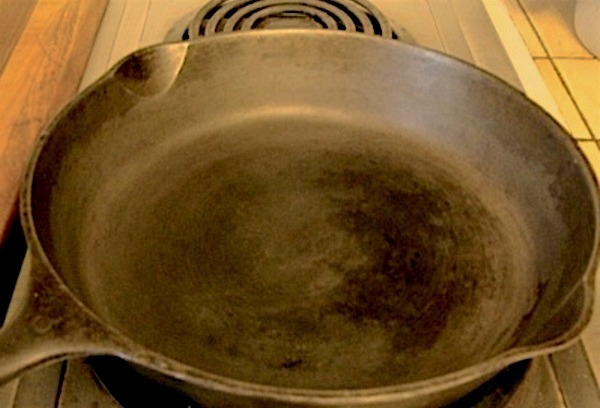 I cannot tell you how excited I am to be able to write about my success with a cast iron pan. Because for many years I was not successful. How many? Twenty years – and I wish I were joking. 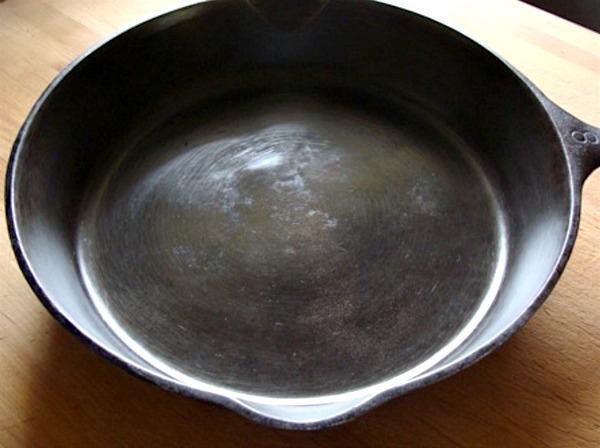 I acquired a cast iron pan shortly after Brian and I were married- I think it came from his grandma, or maybe a thrift store, but it had definitely been used. I didn’t grow up using cast iron, but I had heard people tell me all the reasons they loved their pans: they were naturally non-stick, last more than a lifetime, heat evenly, and so on. So I was was looking forward to trying it in my new household. And try I did. But everything stuck- eggs, meat, you name it. Then I’d shove it to the back of the cupboard, eventually bring it out to try again with the same results, until it got permanently relegated to our little vintage trailer. 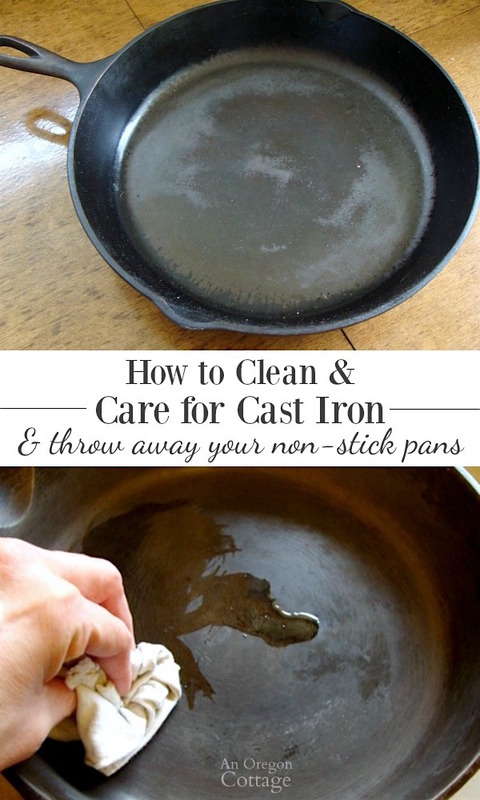 Perfect for vintage cast iron, right? Plus, that meant there were only a few days each summer that I had to use it- and invariably curse it. I know now that when we scrubbed the dickens out of it to get all the stuck things off we were just perpetrating the cycle – hindsight is 20/20, right? However, after a number of years of marriage when my third set of non-stick skillets started peeling, I realized I didn’t want to keep buying new pans every few years so I needed to figure this cast iron pan thing out. By this time my sad, neglected pan was rusty, but thanks to the internet (not around during my first attempts), I found out how to re-season the pan fairly easily. I can’t find the exact steps I followed, but it was similar to this technique at wikiHow. 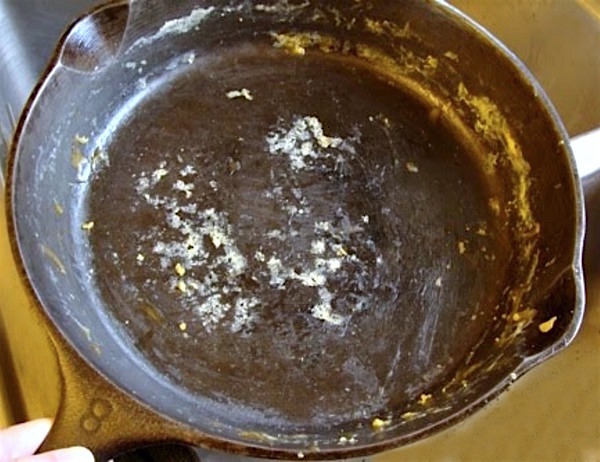 There was one major thing I did differently, though, when it came to coating the pan to season. 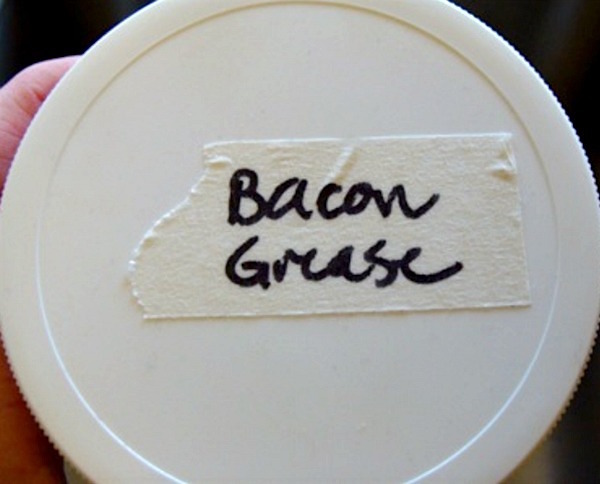 Not canola or a vegetable oil as I had always tried, but bacon grease. Lard or coconut oil can also be used (but not olive oil as the wikiHow article above states though, since olive oil has a low smoke point and shouldn’t be used in applications like this). 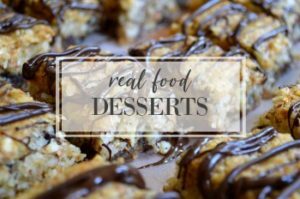 You know that sticky coating that you can feel on old pans, cookie sheets, muffins pans, and other baking pans? This comes from using the industrial vegetable oils that have only been consumed regularly since the 1950’s (and we know cast iron’s been around a lot longer than that). They are called industrial oils because they cannot be made without a factory and machines – think about how you would get oil out of corn in your kitchen. 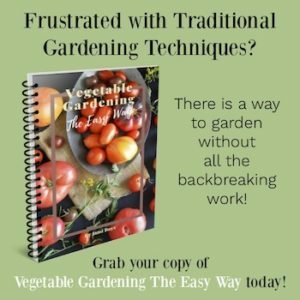 It can’t be done, unlike rendering lard, collecting bacon grease, or even cooking coconut meat to extract the oil. If it can be made in my kitchen, then it’s real food. I can choose to have someone else make it, but knowing it’s possible with the time, tools, and inclination means it’s a food we want to nourish our bodies with. The other thing I discovered was that awful “old oil” smell also is a direct result of using industrial oils. I have found that I don’t get that smell at all when I use a bit of bacon grease to season our pans. Wouldn’t all the food cooked in it have a bacon flavor? Or would it smell like bacon when the pan heated up? While it did smell like bacon a bit when during the re-seasoning process, I’ve found that it doesn’t have an overly bacon smell other times and has never made our food taste like bacon. This could be due to the fact that you use very little grease on the pan to maintain the seasoning – less than 1/8 of a teaspoon. It may be also because it’s best to use only the clear part of the grease (which is, in fact, like rendered lard). Whatever the reason, there’s no noticeable smell or flavor. Oh, and side note that has to be mentioned: the fact that I am using something we regularly used to throw away? You know I love that! I ended up doing two rounds in the oven to re-season my pan initially. For the first few months after seasoning, I cooked only things that were greasy like bacon or things that don’t stick like sauteed mushrooms – putting off the ultimate test in my book: scrambled eggs. And all I can say is I’m glad there wasn’t a video camera around as I was jumping up and down in front of the stove saying “they’re not sticking!” over and over again. As if I was the first one to discover this, ha! Of course I couldn’t keep this to myself. 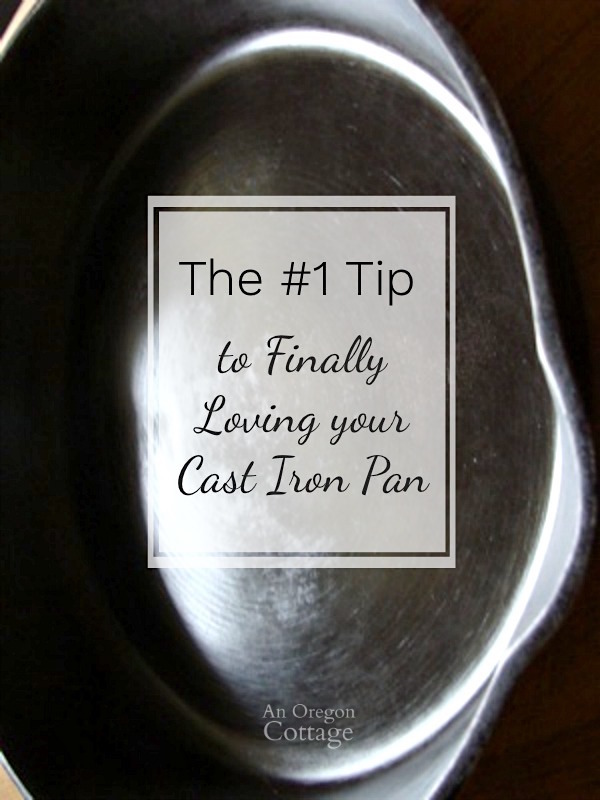 If you’re like me and have had trouble with cast iron – or think it’s too much work – I want to show you how simple it can be and encourage you that cast iron really can become your favorite pan with just a bit of your time and attention! 1. Use a plastic scrubber to remove any stuck bits. Some people use coarse salt, but that would be wasting something in my frugal world. 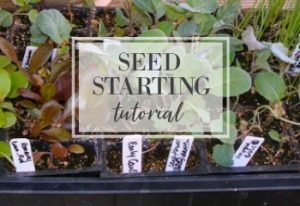 If you have really stuck food, though, that may be a good option. 2. 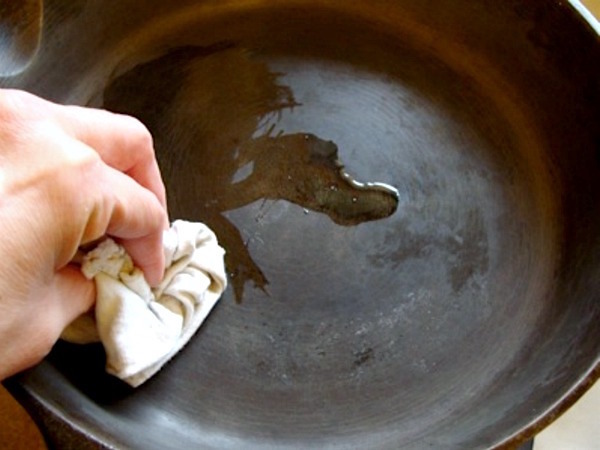 Wash the pan with hot water only and no soap. Yes, it’s OK, it is getting clean, I promise. I use the scrubber side of my sponge and haven’t found that it takes the seasoning off, like some sites warn against. Your call. 3. 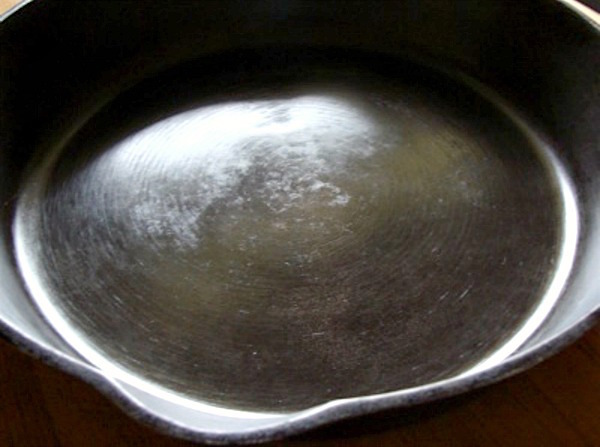 Dry the pan thoroughly on the stove. 4. Remove the pan from the burner and turn it off. Using a rag (or paper towel) grab a smear of bacon grease and rub it all over the inside of the warm pan. Occasionally add it to the outside of the pan, whenever it seems to be looking ‘dry’ and like it needs it. 5. Set the pan back on the still warm burner and let the pan cool there before putting away. That’s it! Do these steps every time you use it and you will keep a nice gleam on the pan that tells you it’s seasoned enough to meet all your non-stick needs. While the steps to clean and care for cast iron may have a few more than non-stick coated pans, it’s well worth it and becomes second nature after awhile. 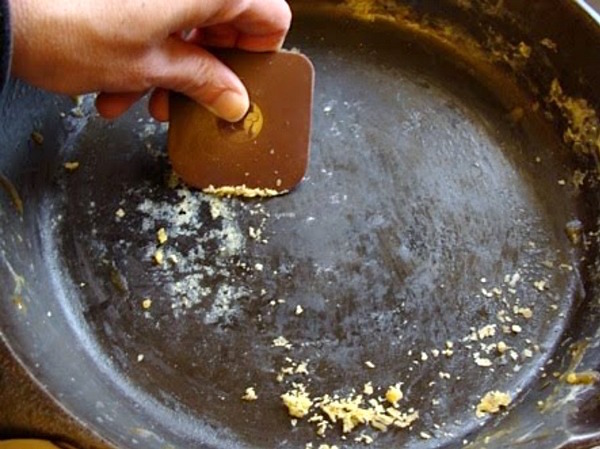 And then you may be like me in saying goodbye to non-stick pans forever. Have you ever had issues with cast iron (tell me I’m not alone!)? Do you use it or want to use it? What are your cast iron stories! Note: This was originally published in March of 2011 and went on to become one of AOC’s first mini-viral posts. For me, it was simply a matter of sharing my excitement over finally figuring out how to use my cast iron pans and throw out the non-stick pans for good. I just had to overlook the fact that thousands of people were seeing my dirty egg pan, ha! Thank you so much!!! Very very helpful! !